Can I just leave this here? I have a love/hate relationship with superglue. It is so helpful….until it is either on my fingers or all over my kitchen counter. My son, bless his heart, was trying to fix something for us. We had an electric wine opener that was dying a slow death. Probably from over-use so much love. I never knew such a thing could happen, that we could wear an opener out, but apparently even a wine opener gets tired. He thought he could take it all apart and (I guess) reconfigure the gears. If all else fails, he could superglue the heck out of it. Enter “GLUEMAGEDDON”! He chose this method without thinking it all the way through. Without placing anything underneath the part of the counter he was working on. He didn’t use the craft room I have slaved over for so long where at least it wouldn’t be the first thing people would see when they come into the house. Where fixing the craft counter would be relatively easy and inexpensive by sanding and refinishing or just replacing the homemade wood counter. Little did he know the carnage his little escapade would leave behind. When I realized what had happened, it was like I was in a horror movie….I actually heard the “Psycho” music in my head when I noticed it. With each sharp note from the violin in my head, the countertop got closer and closer. I didn’t notice it at first because 1. who can even see superglue on a white countertop? and 2. it was about 11 p.m. when I got home and I was just happy to walk into a clean kitchen. (First tip-off that something was wrong, the kitchen was clean). In the morning though, after a couple of cups of coffee, I was cleaning the kitchen (because I am always cleaning the kitchen) and noticed this spot that was raised on the quartz countertop on the island. Then I found another. And another. I tried to scrape them off with the nearest tool available (my fingernail) but they wouldn’t budge. Then I slowly glided my hand over the counter, which is 8′ by 5′, and felt what seemed to be a thousand little raised spots. I thought I would just clean them. NOPE! Not happening. I replayed the events from the day before and I remembered that my son was going to try to fix the wine opener. Then I caught a glimpse of the empty superglue bottle sitting next the wreckage of the wine opener that was now gears and springs and tiny plastic pieces sitting on the craft counter. (Now he uses the craft counter.) Enter “Psycho” music again. It immediately hit me and made my stomach hurt. This was superglue and I was never going to get it off! Now, how superglue managed to get everywhere like a splattered paint project from the 80s I will never know. It is a gigantic mystery. There were globs and splatters and superglue fingerprints over almost of half of the island. When I asked my son why and how he just did not know! Amazing. I think it is a boy thing, boy brain, but….really? Were you not there? Did someone else come in and massacre a bottle of superglue on the island? I could feel the weight of the sinking feeling that had come over me. I didn’t know what I was going to do. The quartz was very expensive and to replace it was not an option. We tried several things to get it off. I was trying not to ruin it any further and felt so desperate. After an hour of trying different methods I finally found the one thing that worked!! Acetone. I had a bottle of acetone under my sink for nail polish removal and was afraid to use it as harsh as it is. However, scary as it was, I thought I had nothing to lose. Thankfully, it was the one thing I could find to take off the residue. I am happy to report that it did not harm the surface or ruin the finish. Gently scrape off drops/globs of glue off counter with razor. Place acetone on cotton disc or cottonball. You could even use a rag, I just wanted more control with the cotton pad. Rub cotton pad over area and remove residue. Wipe area immediately with damp cloth. My son was so apologetic and was so sorry that all of this happened. Still, he could not explain how Gluemageddon happened. It took us 3 hours to clean it all. Starting with just a Qtip, we worked on the raised spots to dissolve the glue for fear that the surface would be ruined. That took the first hour and we didn’t get very far. That’s when we took a sharp razor blade at an angle and gently scraped off any bumps or fingerprints without scratching the surface. I realized that wiping the acetone over the counter with the cotton pad would not damage it and that made it a lot faster and easier and the quartz was not ruined or dulled in any way. Like I said before, you could put it on a rag if you want to, but I wanted more control to work in a small area. 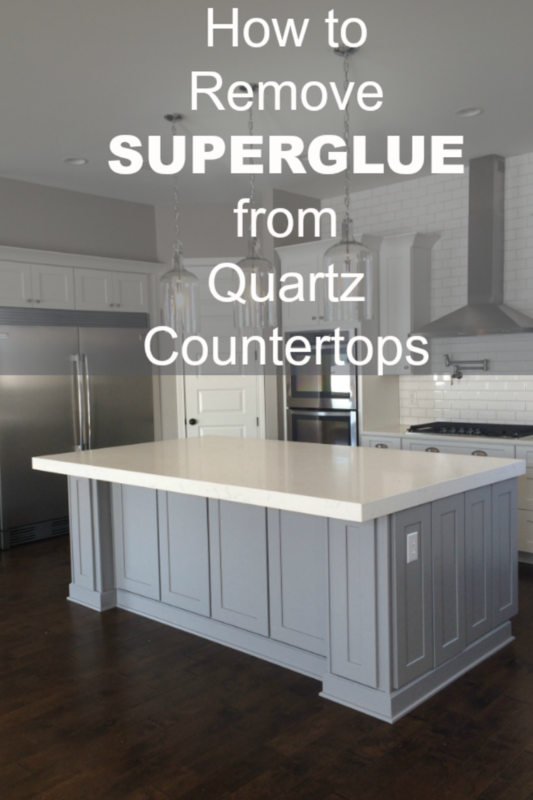 If you ever get superglue on your counters please do not despair. It will come off! In other news, Superglue has been removed from our home. In my country, quartz is very expensive and I saved for a while to complete my kitchen countertops. Unfortunately I spilled glue on my countertop while trying to open it and tried everything to remove it. I despaired, cried and panicked and then I googled for tips and read your column and am very happy to report that it worked just as you described. Thank you. I am SO happy! It is really scary when you don’t know how to fix it! I am so glad that this was helpful to you. It is probably my most read post, LOL!! Happy Holidays!